With the Kentucky Derby—and mint julep season—approaching, it’s time to consider mint, a fast-growing, almost wonderfully invasive plant. A refreshing digestive, mint can be harvested more than once in a season; use it fresh in your mojito, or dried as tea. Mint survives Chicago winters and comes back hardier than ever. Cuttings easily take root and begin propagating anywhere they touch soil. For these reasons, grow mint in a plastic pot, so it doesn’t take over your yard. (The roots are so strong they can crack clay pots.) Mint needs at least four hours of sunlight per day, so pick a sunny spot. It is tolerant of most soils and weather conditions—just be sure it gets some water every week to keep it from becoming bitter. Mints spread in two ways: by runners and by seed. However, many plants are hybrids, which means the sprouts that shoot up from the broadcast seed will probably not be the same as the plant you bought. To keep that lovely flavor you brought home, trim the plants down when they have flowered, but before they drop seed. This causes the plant to bush out and spread from the roots only. Kentucky Colonel spearmint (Mentha spicata ‘Kentucky Colonel’) got its fame from being the leaf of the classic mint julep, but it’s also perfect for any mint sauce or jelly. Banana mint (Mentha arvensis) is part of the spearmint family, but grown mostly for its incredible smell. It still maintains a good flavor in cooking, though. 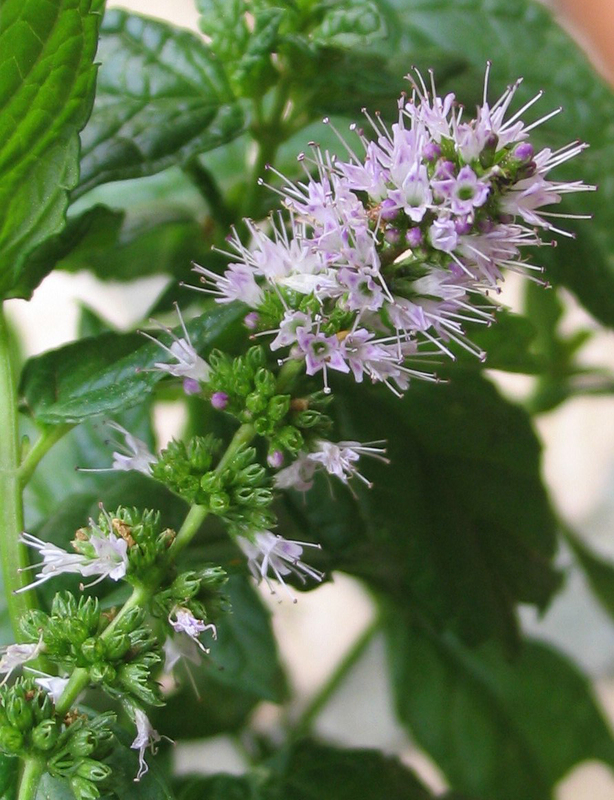 Peppermint (Mentha piperita) is most often used for its peppermint oil. Peppermint family plants are strong flavored and best used dried or in small quantities because they contain menthol (think Vicks). They soothe stomachs, but are difficult to cook with fresh. Variegated pineapple mint is a lovely, sweet-scented peppermint hybrid that makes a great tea. To keep it variegated, you need to cut off any green stems. Orange mint is the most invasive of all mints, so plant accordingly. It smells sharply of orange peel and can turn a nice burgundy color during winter It also works beautifully in baking recipes. Making simple syrup is a great way to put your mint to good use. Rinse and drain mint leaves. Bring water to boil in a small pot on the stove. Add mint leaves and sugar. Stir until sugar dissolves, and then turn off heat. Let mixture cool (approximately 30 minutes). Strain off leaves. Store the syrup in the refrigerator for use within two weeks, or freeze for later use. Add this simple syrup in place of sugar in your favorite ice cream, sorbet, lemonade, soda, or cocktail to add balanced mint flavor to any recipe. Even better, add to a dry wine or prosecco for an easy happy hour treat. Want to take it higher? Freeze the syrups in ice cube trays with a few small leaves and use as a sweetener for tea or cocktails. 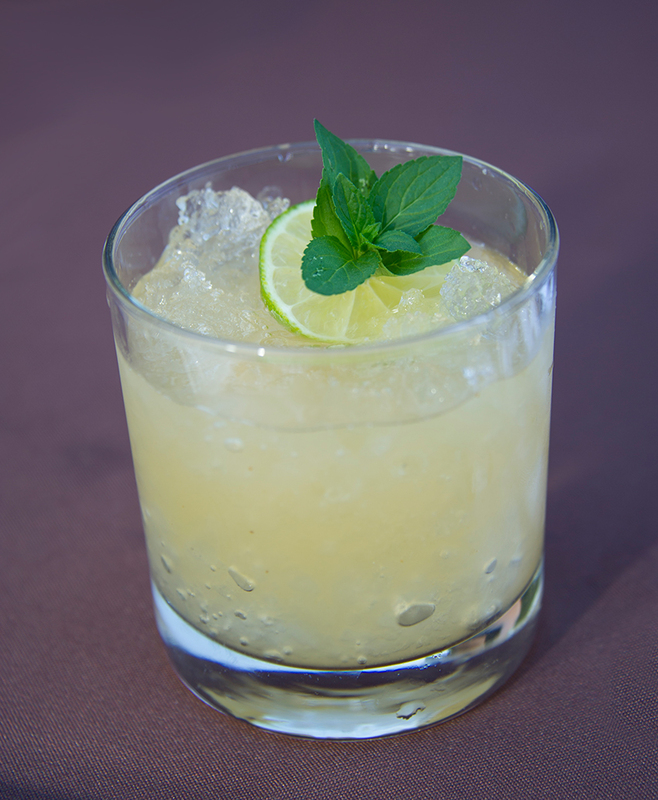 A glass of bourbon becomes a Mint Julep when you add Mint Syrup ice cubes. Peppermint oil is often used for cleaning, pest control or aromatherapy. What you produce is not the professional essential oil (that takes more time and effort than most of us can muster), it will do the jobs needed. Place washed chopped mint leaves in the container (no need to pack; they need to breathe a bit). Heat the oil of your choice (use enough to fill the jar) on the stove in a small pan until it is too hot to touch. Pour the oil over the leaves and seal the container. Let the mixture sit on the counter until it has cooled, then move it to a dark place or cupboard for a week and a half to two weeks. Once it has set, strain out the liquid into a spray bottle. Peppermint oil sprays are said to prevent mold and can be mixed with vinegar to create a simple disinfectant cleaner. They also create a great air freshener, massage oil, or natural control against ants, mosquitos and even rodents. Add simple syrup to Prosecco and peaches: lovely. Want to save more of the amazing herbal flavors in your yard this year? Check out our post on Herbal Mixology for ideas.